Scientific Name: Order Hymenoptera, family Vespidae. Texas Yellowjacket - Vespula maculifrons. Bald-Faced Hornet - Vespa maculata. Identification: Wasp-like flying insects that are smaller than paper wasps. Hornets have shorter waists than wasps. Texas yellowjackets build nests in hollow trees and in the ground. Bald-faced hornets have more dark coloring, and their large rounded paper nests are suspended fully exposed from tree branches. These insects are much more aggressive than most other wasps. Biology and Life Cycle: Complete metamorphosis. The last females to hatch each season mate and over-winter under bark or in the ground. They emerge in the spring to build paper cells in mouse burrows or holes in logs or trees. Habitat: Protected vertical or horizontal surfaces. Nest are normally underground, but can show up in other places. Feeding Habits: Adults eat nectar, fruit juices from holes pecked in fruit by birds. Some eat insects. The larvae are fed insect meat that has been chewed by adults. Most of this food consists of caterpillars, flies, and other troublesome insects. They are also attracted to soda pop and beer left in containers. Economic Importance: Beneficial insects. Try to protect these insects if they aren't located in a dangerous place. On the other hand, they aggressively defend their nests and are dangerous. Natural Control: Spiders, diseases, and parasites, but man is the biggest enemy. Organic Control: Soapy water or citrus products if really necessary. Treat the underground nests at night. Put red cellophane over your flashlight because wasps and bees can't see red very well. Tip from Justin Schmidt, USDA biologist: use a soap or citrus oil drench and then cover the opening with a rock--and run like hell in case any of them escape. Although all wasps are beneficial, these little hornets are dangerous and can be very aggressive. 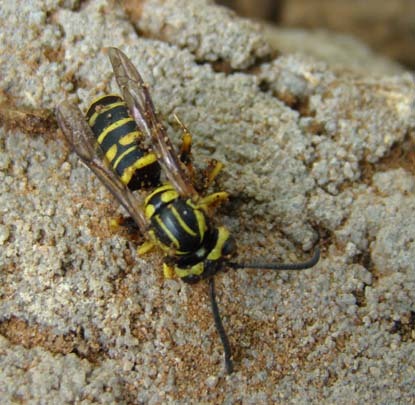 Insight: Texas yellowjackets make their nests underground with a small portion above ground level or in hollow trees or walls of buildings, with a small portion of the nest exposed to the outside. The last females to hatch in a season mate and survive the winter in hiding places such as under bark of dead trees. In the spring each hornet starts a new colony. They work alone building a new nest of a few cells, hatching and feeding a few sterile females until they are mature and can take over the nest enlargement and other domestic duties. The bald-faced hornet is similar in every way to the Texas yellowjacket except their bodies have more dark coloring and their large rounded paper nests are suspended from tree branches and other structures fully exposed. All wasps, hornets, and yellowjackets are very beneficial in helping to control destructive insects such as caterpillars. Some diseases or parasites may attack them, but we human beings are by far their most serious enemy. There is some indication that hornets help to control flies. While working to remove small volunteer trees and ivy from larger trees in my garden one summer, I learned an important lesson about Texas yellowjackets. While listening to the radio on my head phones instead of paying attention to my work, I made a big mistake. Maybe if I had been paying attention, I would have seen the hornets buzzing around their nest entrance trying to warn me. Maybe not. They could have just set me up. At any rate, as you know, I’ve always recommended protecting wasps because of their beneficial insect eating. Most wasps in our Texas gardens are not very aggressive. Texas yellowjackets are aggressive, especially if you stab a sharp shooter shovel down into their underground nest, which is actually what I did. It was in the rotting remains of a dead stump. They stung me about five times before I realized what was happening. The dance I performed next I’m sure was quite impressive. Somehow I made it back to the house with only about 30 or more stings. My attire of shorts and tee shirt allowed them to gain access to most of my body. One of the yellow jackets followed me all around the house to the back yard. I slapped it away whereupon it decided to sting my dog Shadow on the nose. I had a painful couple of days and sleepless nights but was lucky to have a strong immune system. Others could have been in serious trouble. Moral of the story: Watch out for old rotting stumps. We did kill the wasps in this case because I was afraid for the kids in the neighborhood, plus I didn’t want to tangle with them again. We killed them with one of the plant oil products that contains rosemary. The kill was total. Once again, toxic chemicals are unnecessary.